International Desk: North Korea pulled its staff out of an inter-Korean liaison office Friday, Seoul said, weeks after leader Kim Jong Un's summit with US President Donald Trump ended without agreement. 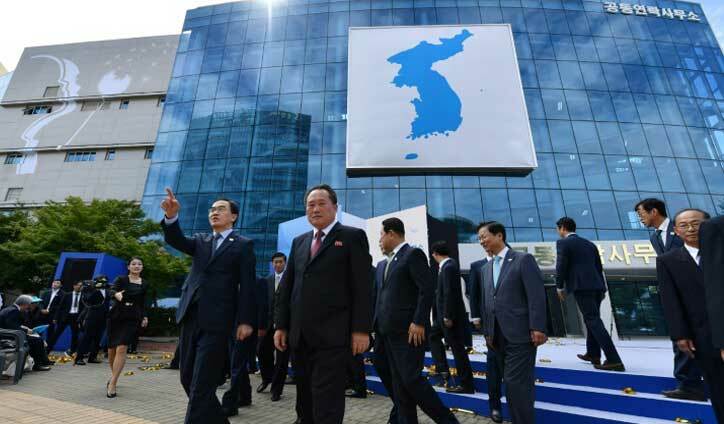 The office in the Northern city of Kaesong was opened in September as the two Koreas knitted closer ties, but the South's vice unification minister Chun Hae-sung told reporters Pyongyang had "notified the South they are pulling out of the liaison office". The decision had been taken "in accordance with an order from an upper command", he said, adding: "They said they didn't care whether we stayed at the liaison office or not." The South's president Moon Jae-in was instrumental in brokering talks between the nuclear-armed, sanctions-hit North and Washington, Seoul's key security ally. Moon has long backed engagement with the North to bring it to the negotiating table, and has been pushing the carrot of inter-Korean development projects, among them the restarting of an industrial zone also in Kaesong and lucrative cross-border tourist visits by Southerners to the North's picturesque Mount Kumgang. But the sanctions currently in place effectively block their resumption, while a preliminary study for a plan to renovate the North's decrepit rail system was repeatedly delayed. Questions were even raised over whether supplies provided to set up the liaison office were a sanctions violation. The failure by Kim and Trump to reach agreement in Hanoi last month on walking back Pyongyang's nuclear programme in exchange for relaxation of the measures against it has raised questions over the future of the wider process. In Vietnam both sides expressed willingness to talk further, but it has since emerged that Washington presented Kim with a wider definition of what it regards as denuclearisation. A senior Pyongyang diplomat told reporters last week that the North was considering suspending nuclear talks with the US. Analysts said Friday's decision could be a sign Pyongyang felt Seoul was unable to exert sufficient influence on Washington.